Beetle charger can charge 2/4 pieces AA/AAA Ni-MH/ Ni-Cd rechargeable batteries, output current 240 mA for AA/AAA. Use it between temperature 0 degree Celsius - 35 degree Celsius. Prevent from reverse polarity. 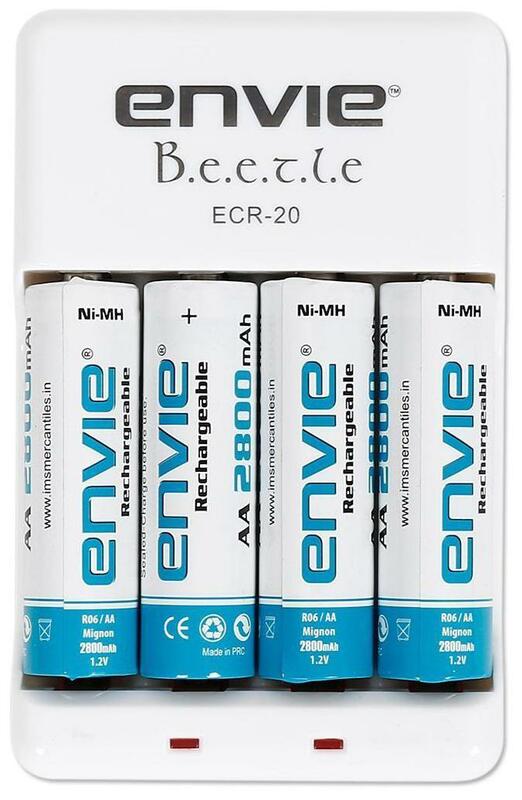 Envie Rechargeable AA 2800mAh battery - The set of batteries have a current rating of 2800mAh. These batteries have Ni-MH (Nickel-Metal Hydride) electrodes to provide you with a safe and stable environment. The batteries are rechargeable and allow you to use them multiple times. The AA Sized battery is compatible with a large number of devices including remote controls, electronic toys, cameras, flashlights, torches and various other devices.